Last week, PFK Consulting sent out a very favorable press release forecasting a continuing rise in hotel performance in the US. Here in NH and VT, we have experienced a high level of tourism resulting in increased performance for most hospitality properties in 2014. In my conversations with lodging operators, mostly in the White Mountain area of NH, most have reported an increased occupancy and higher ADR. Now that the successful summer of 2014 is over, we are encouraged with the optimistic projection for 2015 and the near future. This period of increasing profits, along with increased consumer confidence and optimistic forecasts, makes for an ideal time to sell your hospitality property. Many owners have been sitting on the sidelines as the economy struggled, waiting for a more appropriate time to sell. Any owner who has been waiting, or contemplating a sale, should consider acting during this prime transactional environment. By year-end 2015, PKF-HR projects that the demand for lodging accommodations will have increased 25.8 percent since the depths of the recession in 2009, while the supply of hotel rooms will have grown by just 5.6 percent. 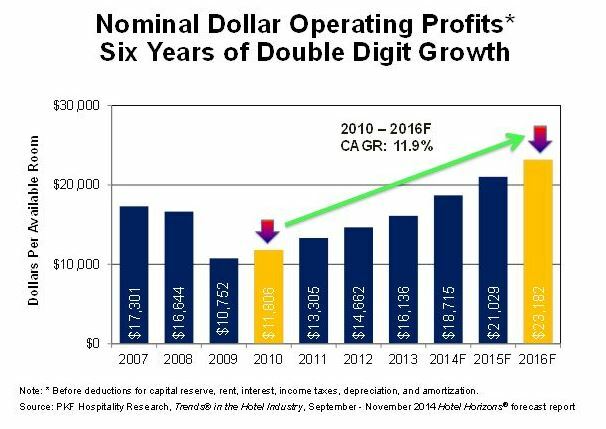 “An ever-improving economy, and the favorable relationship between supply and demand, have led to significant growth in both revenues and profits from 2009 to the current year. We expect this trend to continue through 2017,” said R. Mark Woodworth, president of PKF-HR. PKF-HR’s forecasts of positive performance apply to almost all aspects of the U.S. lodging industry. “Up to now, the economic recovery has mostly impacted high-income, highly-educated, and high-skilled people. This has led to an imbalanced pattern of lodging recovery that has favored upper-priced properties and large coastal markets,” said John B. (Jack) Corgel, PhD. PKF-HR forecasts, that on average, the lower-priced chain-scale segments will achieve greater RevPAR growth (8.4 percent) in 2014 compared to the upper-priced (7.1 percent) categories. These projections and estimates are based on the whole US lodging market. New Hampshire and Vermont are expected to participate in this national momentum, but there are certainly variances from region to region. CenterPoint Business Advisors provides you this information with the intent of helping business owners realize the full value from their hospitality business. CenterPoint assists business owners to build the value of their business, to plan for an exit from their business, to value their business, and to broker the sale of their business. Please contact us if you are considering a long or short term exit from your hospitality business.